So since it’s been weeks and weeks since my kid was born, and I barely remember being pregnant, it’s about time for a birth story and some photos, right? I woke up the morning of June 22 at around 6am with a little crampiness. I remember feeling this way the morning of Violet’s birth day, so I thought huh. This could be something. I went to the bathroom and had a little bit of bloody-tinged mucus, but nothing major. I had planned on going out for a little run that morning, so I laced up and headed out. Had a great (albeit slow) little 3-mile jog. The second half I did have to take numerous walk breaks, at that point the crampiness had definitely turned into some mild contractions. Got home, showered up, had a little more bloody mucus and several bowel emptying bathroom visits, and then made the call to stay home from Fiona’s final gymnastics class. That bummed me out a tiny bit, but the thought of contracting in the car and at the gym was not so appealing. Started timing contractions on my phone at 8:00, after an hour and a half of 2-5 minutes apart and 40-60 seconds apiece I made the call to my midwife. 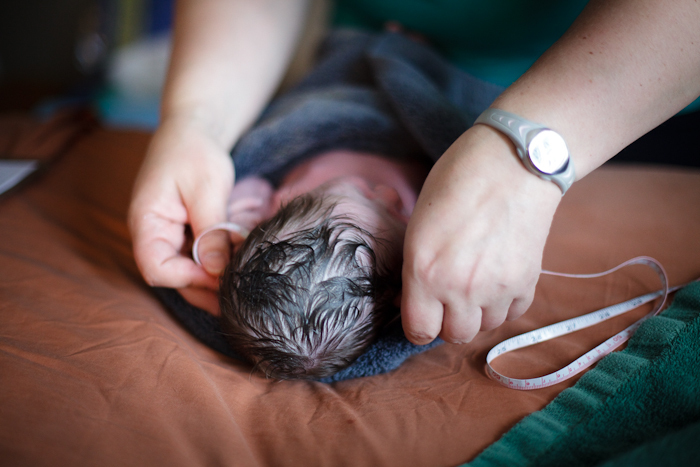 (Well, to my midwife’s backup midwife. We were sure, based on my history, that I wasn’t going to go before my due date, so my midwife went ahead on her scheduled vacation this weekend. 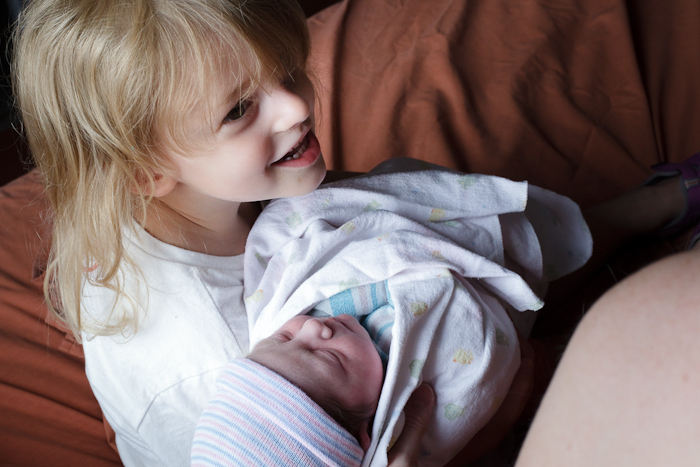 Turns out- baby #3 is unpredictable.) While I waited for her, my sister and I straightened up the house and I tried to eat a little bowl of cereal. 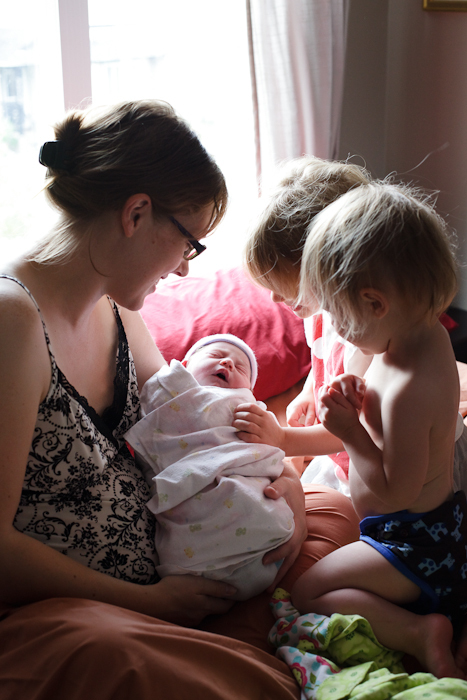 Anyway, the midwife got to the house at about 10:30. 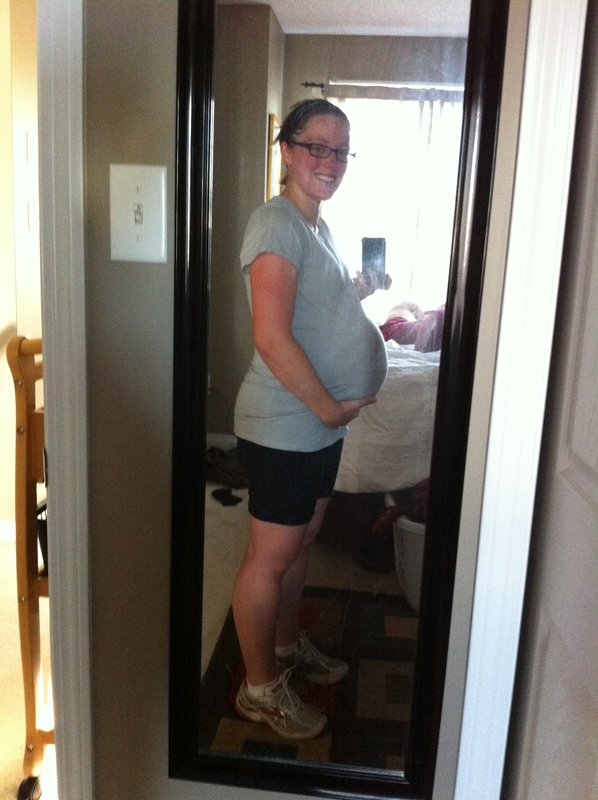 Things were still moving along, I was swaying and yoga breathing through contractions, but it wasn’t too intense yet. We set up the pool, and the girls immediately went and changed into their swimsuits. They thought a swimming pool in Mama’s bedroom was the BEST THING EVER. They played in there for awhile while I kept doing my thing. 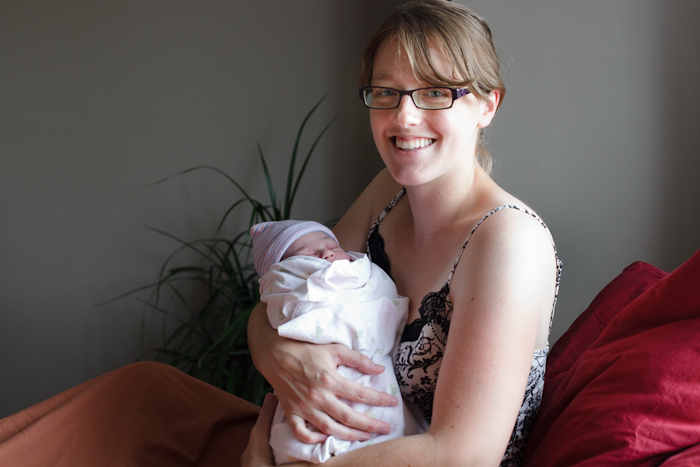 At around noon, Colleen took the kids downstairs to get some lunch, and the midwife decided to check my progress. I was about 80%effaced and maybe 4cm. She then told me she was trying to figure out what to do. Her daughter had an end-of-the-year drama performance at 12:45 and she really hated to miss it. Since I seemed to be doing so well, she wanted to know if it would be okay if she ducked out for a bit to get to that. I did not mind in the slightest. So my (backup) midwife called HER backup, and she peaced out. 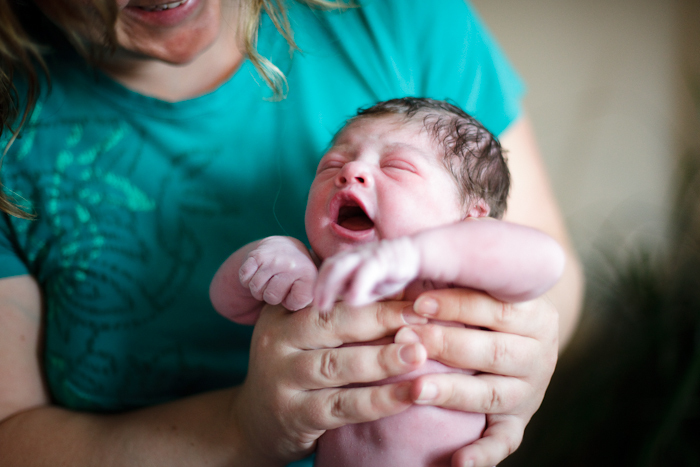 So the backup backup midwife arrived at around 1:00pm. By then contractions had gotten much more intense, and I was vocalizing through them. Still felt okay between them though. At this point I was really wanting to get into the pool. We sent Fiona over to the neighbor’s house, and put Violet down for her afternoon nap. This right here. This sums up why I chose not to have my hooligans there for the actual birth. Once my ladies were taken care of, we added a bit more hot water to the pool, and once I got in… Ahhhhhhh. So nice. After a while I started feeling a little bit of pressure. I had my first two babies in the hospital, so I was really not accustomed to all this “listen to your body” business they kept talking about. I asked to be checked for progress, and I was only at a 6. That was a bit demoralizing. 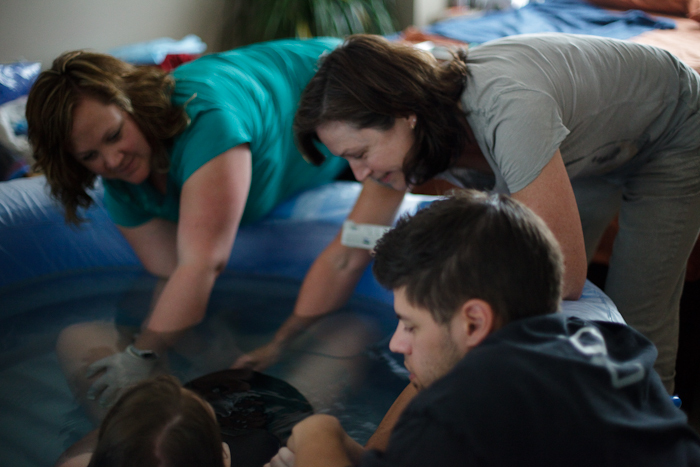 But I got back into the pool, had a couple more contractions, and then there was a shift. I got super focused, stopped chatting between contractions, and things started to get really real. Soon after that I was really starting to feel pushy, so the midwife checked me during a contraction and said I just had a little lip left. I groaned my way through one more contraction (while whining about how I was “so done” and how I “didn’t want to do this anymore” and fighting off beastly leg cramps that kept cropping up) and after that I had to start pushing. This was a few minutes after 3:00. 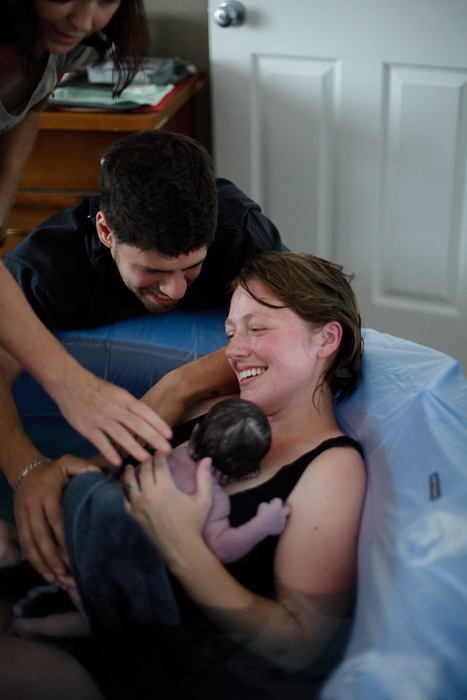 Being in the water was so wonderful, I was able to reach down and feel the baby’s head without getting super grossed out about it, and I was able to support myself as I pushed baby out. (Which meant no tearing, hurrah! )Â It took a few pushes, at one point I could feel the head kind of poke out and then move back up… But on the next push I really went all out, finally felt that head emerge and then one more push for the shoulders. Ahhhhh sweet relief. I was able to kind of catch the baby myself, under the water. There was way less mess than I thought there would be. Actually, the water was totally clear. When the baby came out, she was pretty purply and very quiet, but not in a scary, something-is-wrong kind of way. She was just very calm. And we still didn’t know if she was a he or a she. 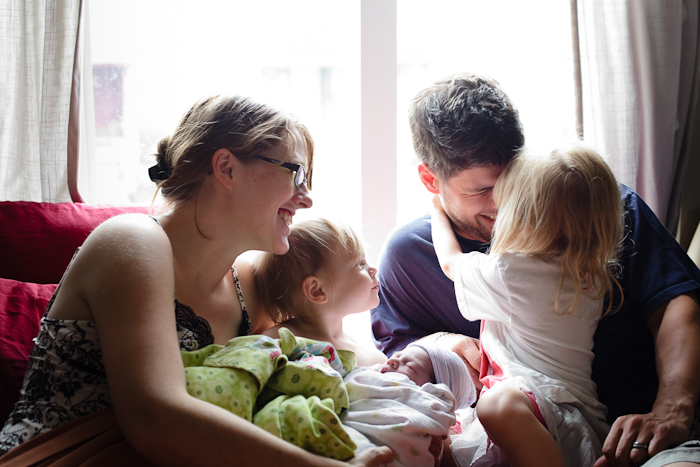 Somebody finally checked, and we were thrilled to welcome our third daughter, even though we had zero ideas for girl names because we were both so convinced I was having a boy this time. 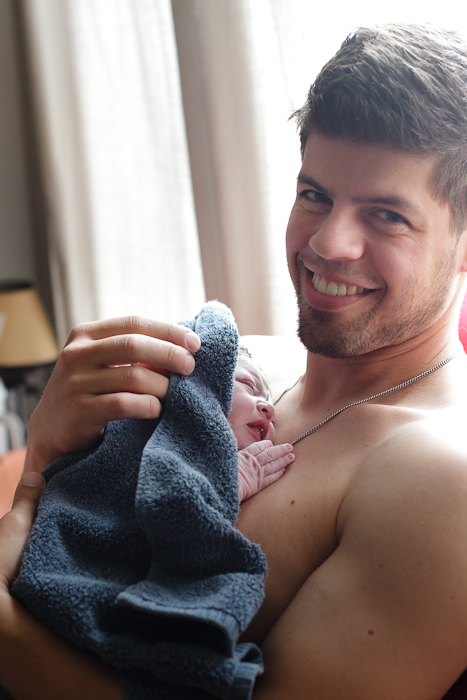 And so our unnamed little baby girl was passed off to Daddy for some skin-to-skin bonding time while I finished up placenta-related business in the pool, then we all cuddled into our bed together, nursed, then ate some dinner while the midwife did all the necessary weighing and measuring. 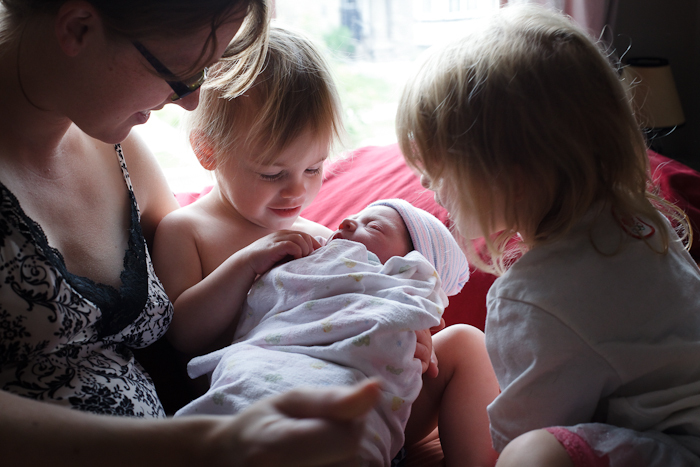 A couple hours later, Violet woke up from her nap, and Colleen ran next door to pick up Fiona, and the girls came in to meet their new baby sister, who by that time did have a name. And that’s the story of Bianca Catherine’s entrance to the outside world. Welcome to the family, babygirl. 20 Responses to "Bianca Catherine." wow. just…wow. 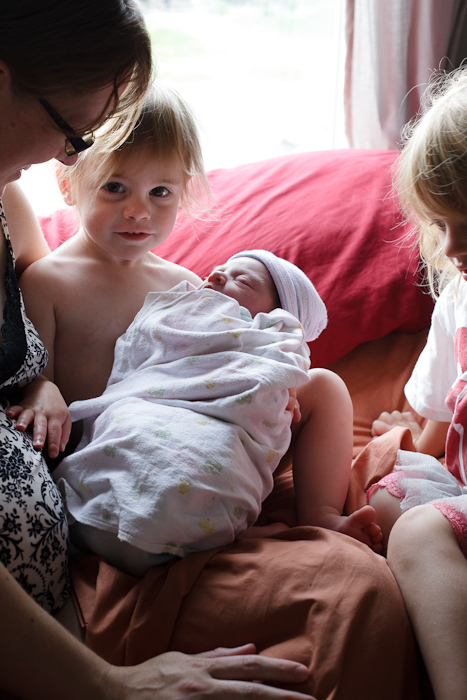 How cool for the girls to go play/sleep and come back with a baby sister! Thanks for sharing! Yeah, I don’t think I could have timed it better if I tried! You are my hero. Holy wow girl, that is nothing shy of amazing. I really don’t know what I am more amazed by, the fact that you have that many pictures and such a detailed chronology, that you went on a run just hours before or that your child slept through the whole ordeal mere feet away. IMPRESSIVE. Thanks, Cheryl! Third time through I knew I was gonna need some memory prompts to be able to recall the details- luckily I had people on hand willing to photograph and take notes! So sweet and what a lovely family you have. And you, lady, are a rock star! Love it. Thanks for all the pictures. I feel like I was there. What a beautiful family. Thanks, Aunt Jane. I’m so happy to have been able to share our story of that day with all our far-flung family members! I had been praying for you folks from mid June on and didn’t know until last week. Prayers are more than answered, as always. Great production!!! And while I had multiple times at that gate no one looks more fabulous than these. An, oh, that little one looks very much like the first one that I had over a century ago–or do they all look alike. Thanks, GG. We love you too! Can’t wait for you to meet this newest little one. Yeah, I love the ones of them together, too. 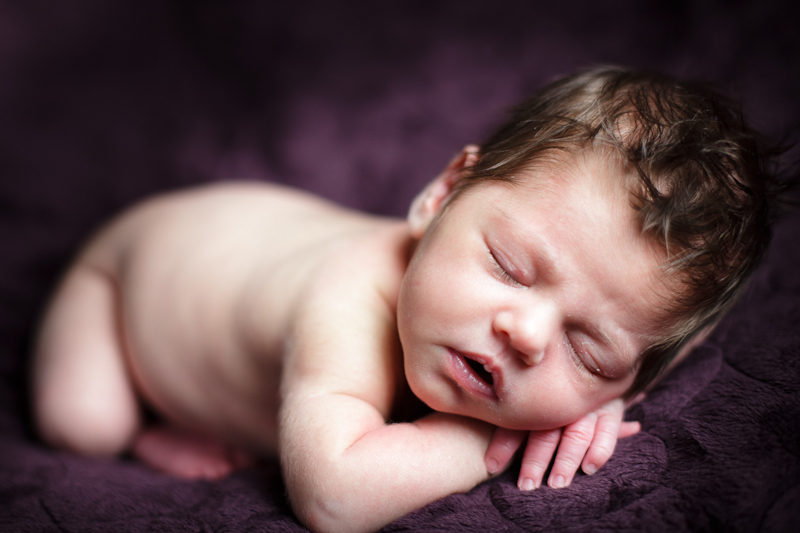 Amanda, your whole birth experience sounded so peaceful and beautiful, I have had 4 at home..such a gift! God Bless all of you and TAKE NAPS! Raeanna, I remember my mom mentioned you’d done home births. So cool, it was a great experience. As to the naps- I do try. Oh my Amanda, I am crying. I didn’t see this before – how beautiful to share this in this way with others. I loved being pregnant & the births were such miracles. Thanks so much for sharing this…she is lovely…God bless your lovely family! We love you & miss you – Mrs. Bonet & the gang! Thanks, Liz! We miss you guys too, hope everything is well. She’s gorgeous and so is her name!